Although Genesis is a part of the Torah, it doesn't contain many commandments. Here are the ones that I could find. Don't eat from the tree of the knowledge of good and evil. Don't touch the tree in the middle of the garden. Every man shall become one flesh with his wife. This commandment is presented several times in the Bible, but first in Genesis 9:4. In my official "Jot and Tittle" list, I will assign the commandment number according to its first occurrence. The other passages will then be listed in biblical order. Muslims and Jews require the blood to be drained when animals are slaughtered for meat to be considered halal or kosher. It is one of the few things that they seem to agree on. 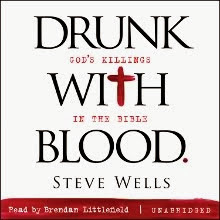 Although abstaining from blood is mentioned in Acts 15, it is unclear what is being condemned -- participating in pagan sacrifices, eating blood, or both. It is included here for completeness' sake. Male circumcision is God's "everlasting covenant." Even Jesus was circumcised when he was eight days old (Luke 2:21). But some passages in the New Testament claim that God's everlasting covenant is no longer required. See Is circumcision necessary? Don't eat the sinew on the hollow of the thigh. That's not really a contradiction on their part. Although the red juices that are found in rare meat are popularly referred to as blood, they aren't blood. The red color is a protein called myoglobin. Good point, JT. I've removed the comment about rare meat. You forgot not partaking of the 'sinew that jumped', due to Jacob's unfortunate wrestling boutwith YAHWAY. There's also 'be fruitful and multiply' at the beginning. - a Jewish medieval work that categorizes the commandments in order of their apearance in scriptures. Yeah, I thought about including the "be fruitful and multiply" command, but I decided not to, since it seemed to be a command for Adam and Eve in Genesis 1:28, to Noah and his shipmates in Genesis 9:1, and Jacob in Genesis 35:11. It doesn't look like a general commandment to me. The bit about the sinew from Jacob's wrestling match with God might be considered a commandment, I suppose. But it seems more like an explanation for Jewish dietary customs, rather than laws. But it's far from clear to me. I've decided to include the "Be fruitful and multiply" commandment, along with God's command to Adam and Noah about having dominion over the earth and every living thing. It isn't clear (to me, anyway) that God is talking generally in these commands, but that's the way many Christians and Jews interpret it. I've also taken your advice and checked the Jewish lists, which has resulted in the addition of another couple dozen commandments that I'd missed. (The numbering is a bit screwed up now, but the list is more complete.) Thanks for your suggestions!